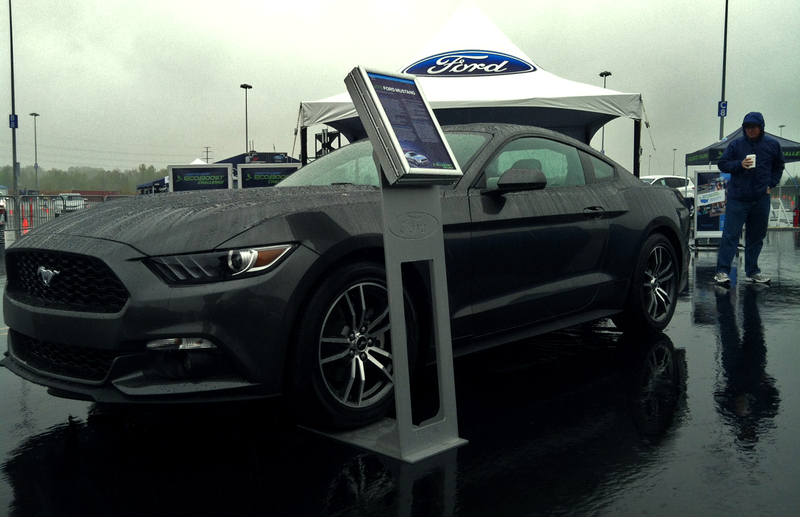 Yesterday the NMS team rode up to Charlotte, NC to the Zmax Dragway parking lot to attend Ford's EcoBoost Challenge. Contrary to predictions earlier in the week, the weather took a turn for the worse and dumped rain and chilly temperatures on the area for the full day, but that wasn't going to stop US! 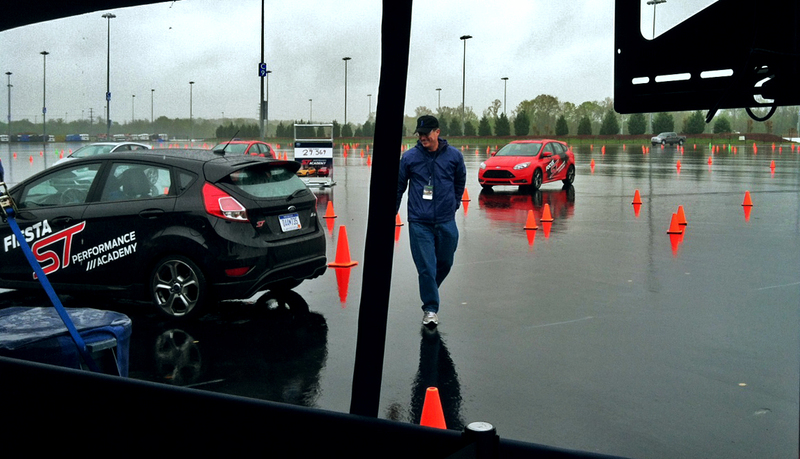 The event was designed to showcase a number of Ford vehicles against their biggest direct competitors as well as get a chance to take a Fiesta ST for a spin on a short autocross style course. Additionally, Ford is celebrating 50 years of the Mustang, so there were a LOT of Mustangs on the roads and on display in the area. 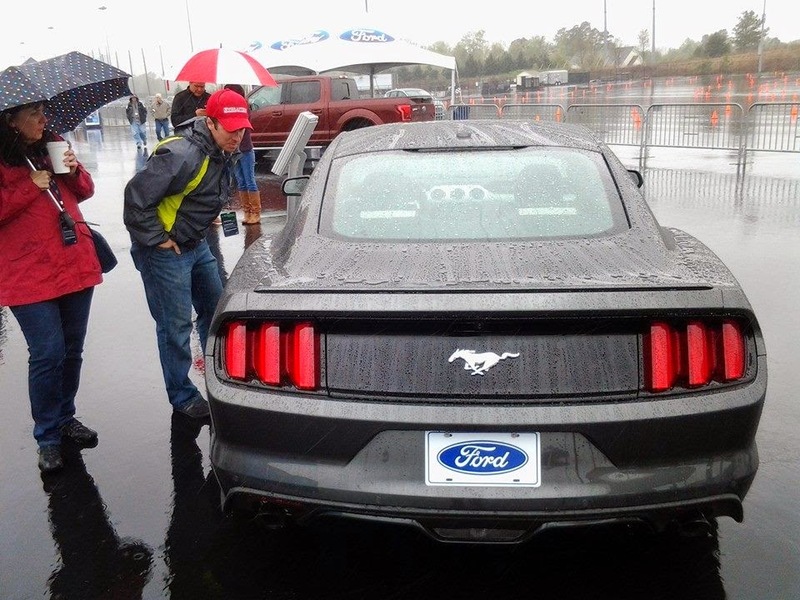 At the EcoBoost event, they had one of the three pre-production 2015 Mustangs to look at. Overall it was a fairly small event with three main areas to showcase the different sets of cars with three small courses laid out with cones, similar to an autocross. The first of three stops was to compare the C-Max versus Toyota's Prius V. Generally the NMS team seemed to favor the Ford, citing slightly better acceleration and generally induced lower levels of dry heaving while inside. The second stop was to check out the Fiesta ST challenge. Unfortunately the staff felt it wasn't safe/wise to set up the timing equipment to time our laps, but generally it was pretty fun, but again 3 short 30 second runs was tough to really get a feel for the car. The third stop was three comparisons in one; Fusion vs Camry, Escape vs CRV, and F150 vs Silverado. This gave you a chance to sample the range of cars, SUVs, trucks all at once. Unfortunately at this point the team had been out in the elements for a bit long and this portion was not organized too well so the decision was made to make lunch plans and conclude the outdoor events for the day and forego any further driving (read: waiting in line and getting rained on). No one voted to go right to the nearest dealership and purchase any new cars, trucks, or SUVs, so it looks like the team will be back with more Fiat and Mazda action next weekend (4/27) with the next SCR autocross at Michelin! The free hot chocolate was good!